Jebus you scared me! If Splat came out looking like Astroblast in real life....*shudders* BRRR! That's just too horrific to think about. It took 5 years, but I finally caved in and bought a Legendary. I refuse to buy normal Astroblast if he is that ugly. 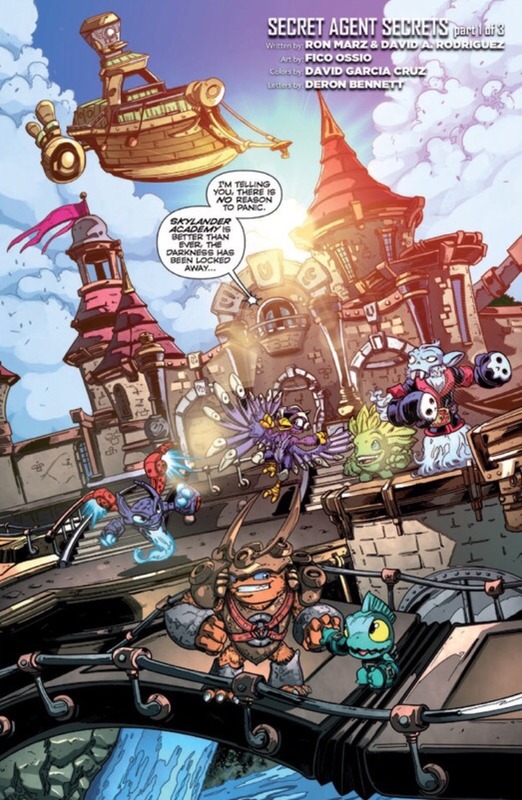 Preview pages of Skylanders SuperChargers Issue 1 is out on iTunes (so far preview pages are blurry until high-quality versions come out). I actually didn't think that Astroblast looked that bad.....until someone compared it with his CGI model. Wow. Still want it but I hope it's the camera quality. I randomly decided to open up one of my interchangeable (Nintendo/PlayStation) Rift Engine Portals. Well, just the Rift Engine itself, but still. It was really easy to remove the two pieces of the Engine from the base, and they could be put together easily as well (though with a gap where it attaches to the base). The top piece of the engine has 2 chips: one at the top, which communicates with the inserted trap's chip, and one at the bottom, which works like the RFID chips in the figures, communicating between the previous chip and the portal (similarly to the 2 halves of the swappers). Then, I put a trap in the detached engine, and put it on my SSF portal while playing SuperChargers, and the trap worked exactly as on the actual portals! This means that Activision/TFB/VV (or third parties such as PowerA) could in theory make a separate magic item/adapter with those chips to use on SSA/SG/SSF portals, and possibly future portals without trap slots. Maybe even future 3DS games, if they bother implementing some sort of trap functionality into those. It will. I was playing online, and both of us had a Trap on the portal at once, and that message appeared! 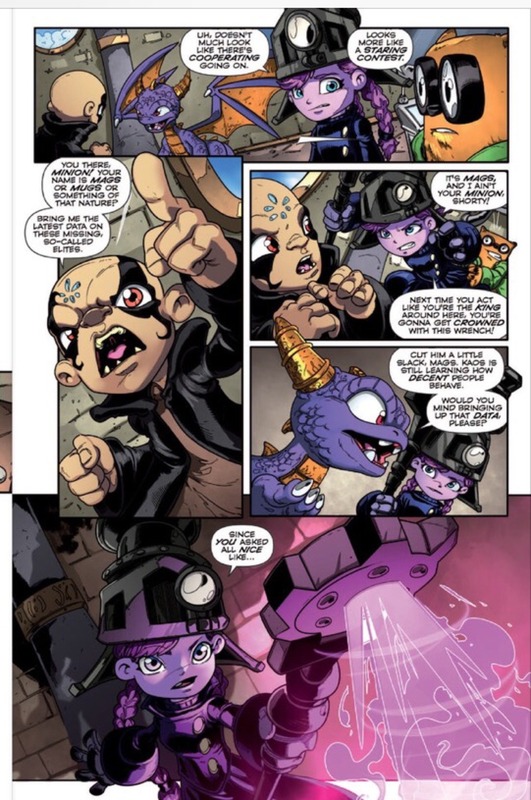 I'm still VERY HAPPY that IDW Superchargers is actually a sequel to the game and not just Rift into Overdrive sprinkled into the following months. Heck,it hasn't been a month,the first comic page spoils the ending thoroughly(so yeah that's a warning for you guys). 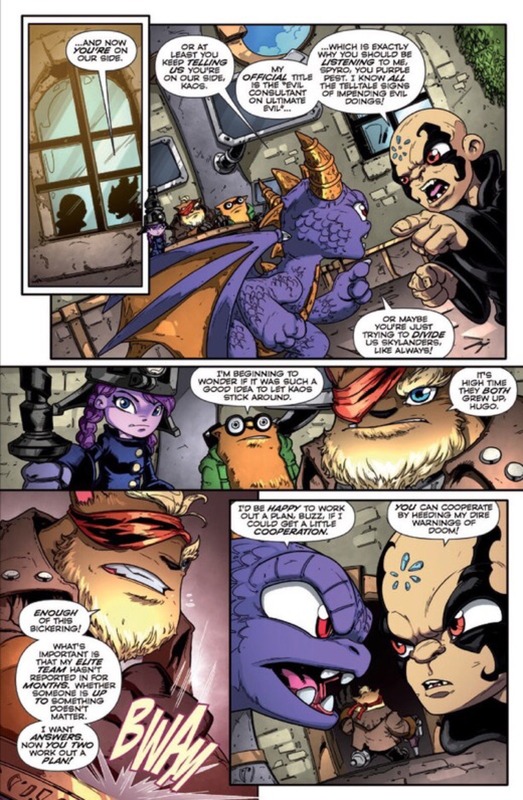 Kaos actually attempting to do his job, Spyro judging before understanding, how things chaaange. If you compare Astroblast with Splat it is indeed a huge difference. Maybe he looks a bit better in game, but he could be the ugliest skylander ever. I am curious if I don't like him if I see him for real. I think I will like him anyway. Even if his face and gun's crystal aren't yellow anymore he still has a lot of other details which are missing from his figure (pearlized gray boots and gloves, differently colored armor, less dull yellow parts). So why does the figure looks so bland if both the artwork and the CGI model look good? Makes me wonder if the true reason why he's in a Racing Action Pack is because they feared he wouldn't have sold well as a single. Such a pity considering Sun Runner is gorgeous figure-wise. I'm begging thats a unfinished version! I am seriously considering getting the legendary, but it seems daft that the light element character should be black. Would love to co-op Superchargers. Great, now I have to live in fear that Nightfall is going to look like crap. Yeah, but we don't know if they're going to paint the "new" ones as amazing. Why in the world would they make new ones. Wouldn't it be cheaper just to switch out the chips of the figures with faulty chips. They obviously can't do that. The packaging is already glued together and the bases of the figure are glued on. Really? That's your comeback. Packaging means nothing. They are going to have to use new packaging regardless. Opening up the figure is not difficult, as many users on this forum can attest to. Not too difficult,but probably too expensive. People throw out perfect products of any kind that won't make as much money as it costs to deliver them,imagine a figure going across the world. Just got night fall. She has an amazing figure. Still doesn't work (didn't expect her too) but up came a weird warning saying "This toy can't be used with this game". Does that mean something? That's the error message in some versions, I think. 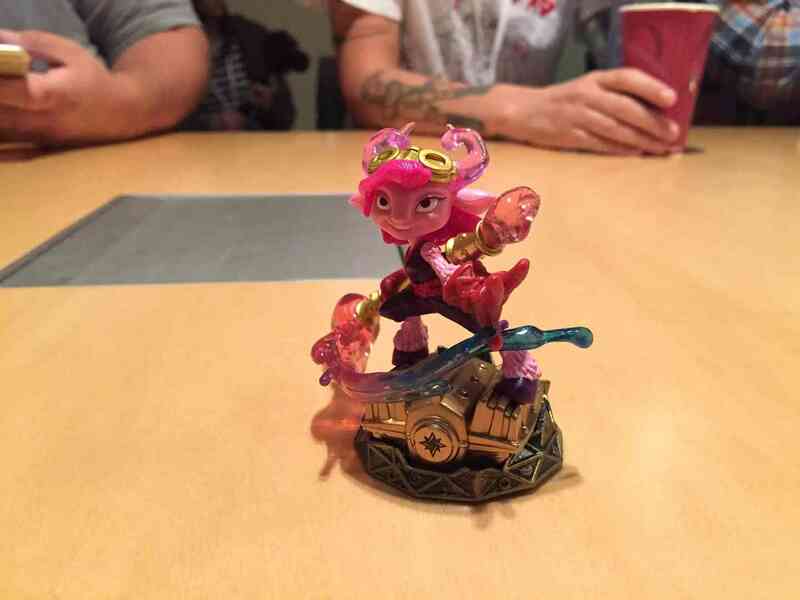 The game knows it's a Skylanders figure,but not who or from which game. If you own an Xbox One or PS4 she works. Did the Xbox One update as well? C'mon PS3, you can do it! Still pretty decided that not having Air and Fire elites is one of the dumbest decisions this year. There's not a SPECK of reason to do this,even no cards can be excused. Now not only the numbers aren't the same for two elements, but TFB would probably get flak for doing two of them(or just them) next year because it'd be a waste of resources to have it nice and consistent again. As long as Undead never gets left out, I'm fine. I can't wait to see EE Hex. I think I'm only getting Slam Bam, Dino-Rang, Ghost Roaster and Possibly Boomer. CAN XBOX 360 PLEASE GET THE NIGHTFALL UPDATE?????? I'm gonna try to get all of them, I mainly want Zook. TBH it all depends on their new powers. Hi everyone I was looking around on ebay and found a nightfall without the name typo it was from Germany does this mean they already fixed the issue of nightfall compatibility in Europe? I managed to figure out who comes with the Land action pack. It's Trigger Happy. He shares a trait with the other two action pack characters, he's the only character that has his Supercharger challenge in the main featured villain's track, namely, The After Party. Bone Bash Roller Brawl's challenge is in the Chompy Garden, so she's outta luck. Just got off of the phone with Activision support. They are sending me a working nightfall and high volt (astroblast wasn't on the list) but they're letting me keep my broken nightfall. All they asked for was a picture of her. Is this normal? I feel like this has been asked before, but my Clown Cruiser won't let me use any mods, even though I've collected everything. How do I fix this? Someone reset their Sea Shadow with that same glitch, try that if you can spare the gearbits. On the working nightfall, wow that's fast. I wonder if they're on the way to stores or they're focusing on the existing ones for now. Would be nice if the regular Astroblast was "lightcore" and his head and gun have a yellow glow. Right now I'm in between Element, gimmick and variant. All my variants are separated out, all my painted figures are separated out, I have Swaps on a shelf by themselves, and the trap masters on a shelf by themselves. Everything else is by element. I'm still trying to figure out how to space wise get Superchargers mixed in, so I figure now was a good time to look into how others are doing it. The frist three games are all together on two shelves organized by Elements while TT and SC have their sperate shelves in which they're also organized by Elements. My Variants are all on one shelve just randomly organized. Organize by type (Core/Lightcore/Giant) and element. Put the vehicles together with their respective SuperChargers. Put the variants together with their original versions. I tried organising my Skylanders by game at first, but it didn't work as well as I liked so I switched to element, which I'm happy with. Do you have a source or proof for this? Haven't started playing the game yet, so I guess that info might be easily found there or in the guide, though in that case I'd wonder why more people haven't picked up on and reported it. Not that I think you're lying - I just want to be 100% sure. This might help, it's only a theory but it makes sense. Yeah, I saw that - I just wondered where the confirmation of Trigger Happy's challenge stage came from. I think you can read that on the guide, not sure. It was in the guide. Also, without spoiling, there are more impressive/emotional moments aside from the most cited one?